Litupas are sjamboks of hide other than hippopotamus. This is a rather small litupa, about 4ft long, max. 1/2 in thick. 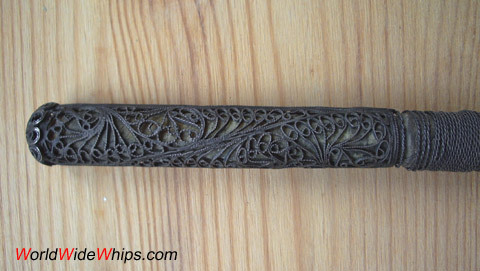 It has a silver handle and some wirings around the shaft (maybe for balancing). The handle has the size of a man´s index finger.